Advice from your peers. 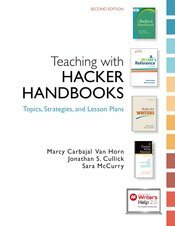 With contributions from instructors at two- and four-year schools across the country, teaching in face-to-face and online course spaces, Teaching with Hacker Handbooks offers advice from a variety of perspectives and strategies that are suitable for any teaching environment. Free and there when you need it. Available in print and online at hackerhandbooks.com, this free collection can help you carefully plan your next lesson or give you a ready-made group activity to fill those unexpected extra ten minutes of class. Flexible content. Modules provide complete lesson plans that you can customize to suit your teaching environment and your students’ needs.